Wolves' Halliwell Jones Stadium, Warrington Commissioned by Warrington Borough Council with joint funding from Warrington Borough Council lottery and Birse Group Plc. Memorial commissioned to celebrate former Warrington Rugby League Club player, Brian Bevan. The cast bronze, running figure is set at 4 metres high on three steel masts - overall height: 11.5 metres. Triangular base designed with WBC Technical Services. The sculpture was originally sited on 30 metre diameter roundabout. 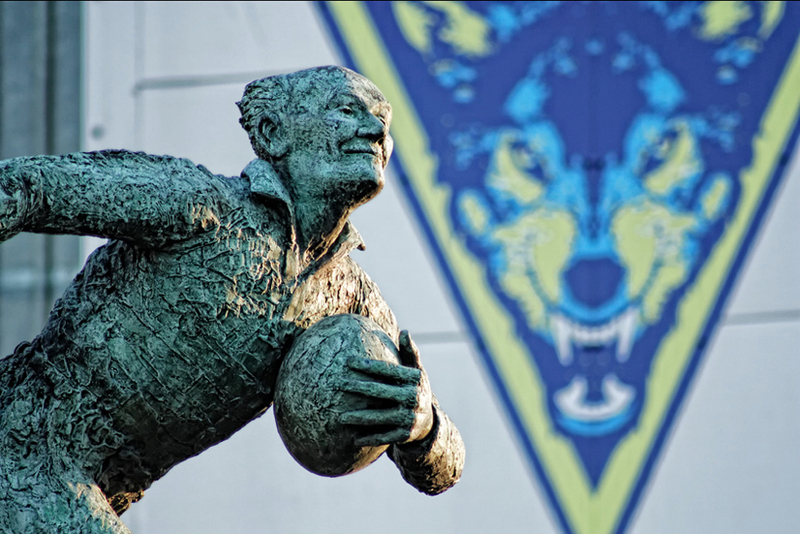 Later on the Brian Bevan memorial statue was re-located to its new home outside Warrington Wolves' Halliwell Jones Stadium. Phil designed and liaised with Warrington Fabrication Co Ltd for the manufacture of the steel masts. Plaster original figure made by Phil, the bronze was cast by Castle Fine Art Foundry.